Sweet Lavender or Lavandula heterophylla is a hybrid Lavender plant of Lavandula dentata and Lavandula angustifolia. This a very tough quick growing Lavender that reaches 3-4 feet in size when in bloom. One of the largest hybrids! Proven tough enough for even Australian conditions. Flowers appear in early to mid spring and will repeat a lesser display in fall. The deep violet purple colored flowers present themselves on long 15 inch stems that reach upwards to the sky. The fragrant flowers have a slight piney undertone making this hybrid not a great choice for culinary use. The lovely violet flowers may be used for fresh bundles but do not dry well as the buds tend to drop. They make lovely Lavender wands due to the long flexible stems. 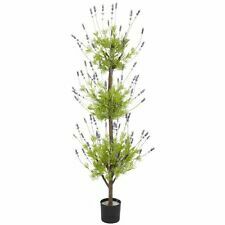 The foliage is brighter than other Lavender plants featuring bright spring green leaves that contrast nicely with the large dark purple flowers. This is a showcase Lavender that is not shy about showing itself off. The plant is very much similar to Lavandula allardii but the plant is a bit smaller overall and the color more green. The mature basal leaves tend to take after its French dentata heritage showing coarsely dentate leaves with some being partial and some completely divided. This is a Pterostachys Lavender that is hardy in zones 8-11 to 20 degrees Fahrenheit. Please give this plant room to show off by spacing Sweet Lavender heterophylla at least 36 inches or more between plants to allow room for the long flower spikes.